Ruby Fortune Casino was launched in 2003 by the Palace Group of Casinos and is powered by Microgaming Viper. In its first year of operation, the casino won a ” best casino” award. It has a lavish design that can be accessed via personal computer, smartphone, or compatible mobile devices. Ruby Fortune Casino is open to most European countries. 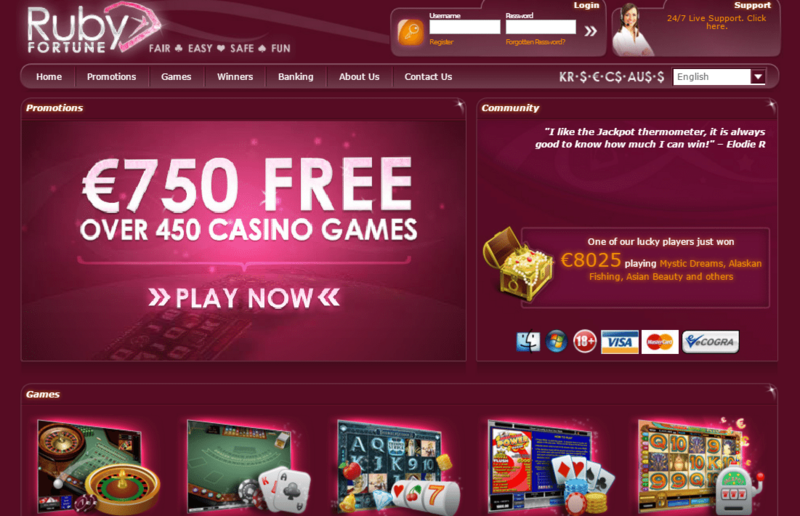 Everyone who registers as a member of Ruby Fortune Casino receives a Welcome Bonus up to $750. It is broken down into three stages that correspond to the first, second, and third cash deposits. After the first cash deposit, the casino will match 100% up to $150. The next deposit will get a 50% matching amount for up to $200. The last deposit up to $400 will be matched by 25%. These deposits have to be made within a week of registering with the casino. As with most Microgaming casinos, Ruby Fortune requires a 50X playthrough for withdrawal of each bonus section. The welcome bonus is limited to slot playing. There are smaller bonuses for smaller deposits, so the casino is friendly on any budgets. The minimum deposit is only $20. The more members play at Ruby Fortune Casino, the more rewards they receive. Loyalty rewards are given in Euros, with is the casino’s currency form. When players register, they automatically receive 500 free loyalty points. More points are added during each visit. The casino’s loyalty club has 6 tiers, starting with Blue up to Prive’ (Private). When players reach the second tier (Silver), they have to get a minimum number of points to move up and maintain on each loyalty tier. Higher tiers increase bonus points and offer larger monthly bonuses. The higher members go, the more the benefits and rewards are increased. When players reach the Gold level, they have earned their own VIP account manager. They also get special gifts and access to exclusive promotions and competitions. The casino has special VIP events for all Diamond, Prive’ and select Platinum members. These highest level players get customized bonus offers, faster withdrawals of funds, and invitations to world-class sporting events. For every €10 players bet on table games, slots, or American-style roulette, players get one loyalty point. Other games count, but at a lower rate. When loyalty members save up to 1000 club points, they can redeem them for casino credits worth €10. Depending on how many loyalty points are earned during the month and in what tier players are, they have the chance to earn bonus points in addition to their loyalty points. The Lotteries and Gaming Association of Malta licenses Ruby Fortune Casino. It has an eCogra certification and its table games and slots consistently pay out in the 95-96% range. If casino members have any questions or concerns, they can contact Customer Support. The friendly and knowledgeable support staff can be reached by live chat, email, or telephone. They support multiple languages for customer convenience. All of the games in Ruby Fortune Casino use the most recent Microgaming Viper software. Microgaming is a trusted name in online casino software operations around the world. This software company has been in business for nearly 25 years and offers the most technically advanced gaming systems on the market. It gives Ruby Fortune astounding graphics, superior sound quality, and animations that are desired by serious players. The casino offers players hundreds of entertaining wager games in all imaginable types. Just the slot machine section alone has 300 games from which to choose. They range from penny-ante to the high-rolling multiple slots. Another feature in this casino is that players can play a game for free to see if they like it. If so, then they can use real money to continue playing. Ruby Fortune can be accessed in several different ways. People who enjoy betting games on their home computer can download the user-friendly software. In just a few minutes, they can register and have access to the whole gambit of games. Some may prefer not to download anything and can just play select games on the instant play flash version, which is compatible with PC or MAC computers. Still other members may opt to play on their smartphone or other compatible mobile devices. It makes gambling on the go much easier. Players can bet on select games wherever and whenever they want. Slot game aficionados will appreciate the variety of slots available in Ruby Fortune. Even the Welcome Bonus is geared specifically for slot players. Many of the titles may be familiar to those who have played in Microgaming casinos in the past. During a visit to the lobby, players can find new and different games that are recommended. Each month, Ruby Fortune releases new games from Microgaming to add to their impressive collection and the casino’s members have premier access. This casino is part of the multi-casino jackpot network from Microgaming. With all of the casinos involved, there can be some huge jackpots building up to be won. Some of the popular ones are Mega Moolah and King Cashalot. There are over a dozen different progressive slots that can be played for millions. As a special bonus to lucky winners of a $25,000 jackpot or more, the casino gives a congratulatory extra give of $1000. No matter how often members come to the casino to play, there will be plenty of slots to pique their interest and try their luck. However, Ruby Fortune has more than just slots. They have a large assortment of popular table games, from video poker, roulette, and blackjack. Each one of these games has exciting variations. Players have a choice from a private table to one with multiple players. Players can make transactions with confidence in Ruby Fortune Casino since it is certified by eCogra’s high standards. Each one of the games is tested each month for fairness. The full disclosure of the results is published on eCogra’s website. Players can access this information at any time. This casino’s payout statistics stay in the 90-95% range. International members of Ruby Fortune enjoy a variety of ways to fund their accounts. Many of these options are also available for withdrawals. The casino is strict about the privacy and security of every player’s account. They used advanced encryption technology to keep all personal and financial information protected. Players can have fun gambling in Ruby Fortune without worrying about their information being compromised.